According to the Defense Logistic Agency website, DLA supplied more than 2.8 billion gallons of fuel to Operation Iraqi Freedom and more than 2.2 billion gallons of fuel support to Operation Enduring Freedom as of March 2006. This makes more than 5 billion gallons, or more than 119 million barrels of oil. Today 56 000 barrels of oil per day, with a cost of at least $3 million, is consumed by military in Afghanistan and Iraq. 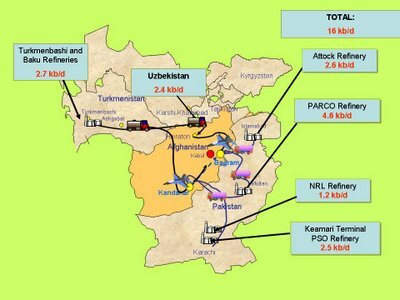 According to the DLA facts as of March 2006 “more than 2.2 billion gallons of fuel,” which makes 52 million barrels, was supplied to Afghanistan. The first issue of Fuel Line in 2006 (page 6) gives a daily consumption rate of over 270 000 gallons (6.4 kb/d) of oil across Afghanistan by the US military. According to a recent presentation by DESC, in fact 570 000 gallons per day, or 13.6 kb/d, of bulk fuel is supplied to the US bases in Afghanistan. That estimate, however, excludes deliveries from Uzbekistan. A very large portion of Operation Enduring Freedom’s mission is supported by Bagram Air Base in northern Afghanistan and Kandahar Air Base in the southern area. The fuel needs of American forces in Afghanistan are met in three ways. (a) Refined oil products are shipped over 1600 km by rail and truck from a Turkmen refinery on the Caspian Sea to American facilities in Afghanistan. (b) Fuel is trucked from four refineries in Pakistan passing through the Khyber and Salang Passes and is delivered in a week time. On any given day, there are more than 300 trucks, carrying approximately three million gallons of fuel (71429 barrels), en route to military locations downrange. (c) A recent agreement with Uzbekistan  provides for 100,000 gallons of jet fuel  per day for use in Operation Enduring Freedom. Source: Sohbet Karbuz, based on a slide in D. Jennings and N. Dyson, DESC-ME Mission Brief, presentation at the WWEC 2006, 20 April 2006. In total, the US military consumes roughly 16 kb/d of oil in Afghanistan. Of this amount roughly 2.7 kb/d comes from Turkmenistan, 2.4 kb/d from Uzbekistan and 10.8 kb/d from Pakistan. According to the DLA facts as of March 2006 the US military oil consumption in Iraq was more than 2.8 billion gallons, which makes 67 million barrels. According to Colonel Rohrer, Director of Bulk Fuels, American forces in Iraq use more than 1.3 million gallons (31 kb/d) of fuel each day. According to an Atlantic Monthly article, however, it is 1.7 million gallons of fuel a day (40 kb/d). A recent presentation makes it clear that 1.3 million gallon figure, in fact, is only for JP-8. Therefore 1.7 million gallon figure (even if it is 2005 estimate) seems more appropriate. All fuel flowing in to Iraq travels by one of three routes. 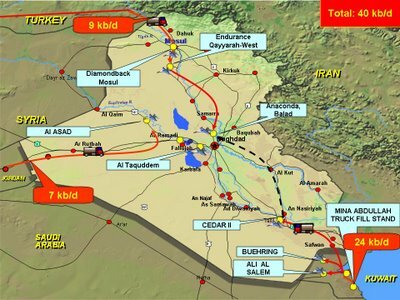 Fuel originating in Kuwait, Turkey, or Jordan is trucked, under DESC contract, along one of these routes and delivered to one of three main hubs in Iraq, western, southern and northern hub. Originally, the Kuwait route was the only source of fuel for our forces in Iraq. The Turkey and Jordan routes were opened later to help reduce the number of fuel convoys. In February 2005, the Army asked DESC to take over the mission to distribute within Kuwait and to deliver from Kuwait to the southern hub in Iraq. The Kuwait Petroleum Corporation supplies Jet A-1, as well as diesel and gasoline. Every day some 2 000 trucks leave Kuwait alone for various locales in Iraq. In spring 2005 a new fuel supply chain in terms of long-term contracts (for AVGAS, diesel and gasoline) from Turkey to Iraq was established. This removed the Air Force’s requirement to transport fuel from Al Udeid, Qatar (which was the hub from which all fuel was transported into Iraq). Even though the fuel supply from Turkey was briefly cut in the beginning of 2006 due to unpaid bills, it was resumed later on. For JP8 is transported through the Turkish NATO Pipeline System at Mersin to West of Adana COCOC, a facility owned and operated by the Turkish Ministry of Defense. MOGAS and Diesel are loaded at the Petrol Ofisi terminal in Iskenderun. AVGAS originates from Ankara. All trucks from different destinations reach Gaziantep, and then follow the same route to East of Cizre where they wait for numbering. Once trucks clear Turkish and Iraqi customs, they proceed to the U.S. controlled Movement Control Team staging yard at Habur Gate. Minimum time for delivery to the US bases is one week. DESC–Jordan “delivers more than 25% of the overall fuel entering Iraq, which equates to more than 9 million gallons of JP-8 and 50 thousand gallons of Diesel,” per month I presume. According to my conservative calculations, it would not be wrong to say that in total the US military consumes roughly 40 kb/d of oil in Iraq. Of this amount roughly 7 kb/d comes from Jordan, 9 kb/d from Turkey and 24 kb/d from Kuwait. According to the Defense Logistic Agency website, DLA supplied more than 2.8 billion gallons of fuel to Operation Iraqi Freedom and more than 2.2 billion gallons of fuel support to Operation Enduring Freedom as of March 2006. This makes more than 5 billion gallons, or more than 119 million barrels of oil. According to my conservative estimates (based on official figures) the US military consumes daily 56 000 barrels of oil per day (or 56 kb/d) in Afghanistan and Iraq. Roughly 16 kb/d of oil is consumed in Afghanistan. Of this amount roughly 2.7 kb/d comes from Turkmenistan, 2.4 kb/d from Uzbekistan and 10.8 kb/d from Pakistan. Roughly 40 kb/d of oil is consumed in Iraq. Of this amount roughly 7 kb/d comes from Jordan, 9 kb/d from Turkey and 24 kb/d from Kuwait. With an average cost of $40 per barrel, delivered fuel cost for 119 million barrels of oil in more than four years (up to March 2006) is roughly $5 billion. Today, it should stand at over $3 million a day. Note that this is the cost for delivered fuel, whose price are normally fixed in advance for an entire fiscal year, and does not include the delivery cost. “Ten years after the Cold War, over 70 percent of the tonnage required to position today’s U.S. Army into battle is fuel. Naval forces depend each day on millions of gallons of fuel to operate around the globe. The Air Force, largest DoD consumer, spends 84% of its fuel delivery budget to deliver 6% of its fuel.” DESC alone spends $1 million per day just for transportation cost. Besides that it should be kept in mind that the DESC has been officially tasked by the Office of the Secretary of Defense (on December 23, 2003) “to provide the necessary expertise and support to the Task Force-Restore Iraqi Oil (TF-RIO) mission for the importation and distribution to specified fuel depots of identified petroleum products in support of the Iraqi civilian populace. TF-RIO works with the Iraqi oil industry to rebuild the petroleum infrastructure and to jumpstart the country’s petroleum production again in order to support the country’s petroleum needs and to generate state revenues via oil exports. DESC took over the mission to procure and import fuel to eight designated distribution centers throughout Iraq, effective April 1, 2004.” A strange day! Unfortunately, total amount of paid and unpaid oil used by the US military in “freedom” operations in Afghanistan and Iraq, and its true cost (including delivery) are still a mystery. According to the DESC Factbook for Fiscal Year 2005, DESC supplied 130 Million barrels of oil (64 Mb domestic and 66 Mb overseas), or 356 kb/d with a cost of $9 billion. Of 66 Mb overseas supplies 5.1 Mb was into plane, 3.2 Mb bunker, 49.9 Mb bulk fuel and 7.9 Mb Posts, Camps and Contracts. However, a bottom up analysis (as I did for Iraq and Afghanistan) do not conform with DESC numbers, at least for overseas. The DLA and DESC spend an immense effort for delivering the fuel to end users, but they should also spend a bit more effort in reporting and should become more coherent, concise, complete, and transparent. By the way, even if we take DESC figure for the US military bases overseas at face value, it (180 kb/d of oil or $11 million a day) surely does not show up anywhere in world oil demand statistics, and hence is missing. A last note: The US military bases in Iraq and Afghanistan (including the ones identified here) are not counted in the 3,748 military sites listed in the Base Structure Report for Fiscal Year 2005 of the US Department of Defense. D. Jennings and N. Dyson, DESC-ME Mission Brief, Paper presented at the WWEC 2006, 20 April 2006. Fuel Line, Vol 1, 2006, P. 37. Fuel Line, Vol 1, 2006, P. 9. Or as Bulk Fuels Deputy Director Jim Cotton says, “We have pushed enough petroleum products under the Operation Iraqi Freedom support structure to fill the Empire State Building over seven times.” Fuel Line 2006 p.24. R. Bryce, “The Military Gas Pains”, The Atlantic Monthly, May 2005. D. Jennings and N. Dyson, DESC-ME Mission Brief, presentation at the WWEC 2006, 20 April 2006. The Air Force initially established Seeb Air Base in Oman as the hub for distributing aviation gasoline (AVGAS) to various locations throughout the theater. FY2006 standard prices (effective on June 1, 2006) are given on DESC website. More Capable Warfighting Through Reduced Fuel Burden, Office of the Under Secretary of Defense for Acquisition, Technology and Logistics, The Defense Science Board Task Force on Improving Fuel Efficiency of Weapons Platforms, January 2001. Dimensions, Summer 2004, Page 9.